Kitchen worktops, bathroom surfaces, hobs, sinks, pans… With so much to keep clean, it’s no wonder our under-sink cupboards end up jam-packed with loads of different cleaning products. What if there was a cleaner that shifted grime from loads of different surfaces, and could replace some of those space-hungry bottles, too? Here to deliver fantastic results and save you loads of cupboard space (not to mention a bit of money), is the wonderfully multi-purpose Bio-Mex. Made from 100% natural, biodegradable ingredients, it’s a one-pot wonder that will get a huge variety of surfaces gleaming all around your home, and outside, too. A customer favourite, Bio-Mex has been in our range for a good while now, but we have to admit we’d been taking this hard-working tub for granted… We decided it was time we got reacquainted, so we took a pot to the staff canteen at our Windermere HQ and got to work. Oh boy, were we glad we did! Intending to simply try it on the sink (which gleamed afterwards! ), we were so impressed by the results we kept on looking for things to clean – we’d forgotten how shiny the hot water taps used to be, and as for our brewing-up area… with hundreds of staff making their daily cuppa, the work surfaces had become stained with tea and coffee; we didn’t realise quite how stained until we gave them the Bio-Mex treatment to reveal the much lighter original colour! The worktops have now been restored to their former glory! With so many baking and cooking products to be tried and tested, our poor test kitchen’s oven doesn’t half get some stick. Before testing out a recipe, Zoe – one of our lovely Windermere Store colleagues – gave it a once-over with a bit of Bio-Mex. She simply could not believe the difference it made! In fact, Bio-Mex did such a good job that our other colleagues were soon popping into the test kitchen just to admire Zoe’s handiwork! Lots of Lakeland staff are rediscovering Bio-Mex, including Anthea from the Creative Content Team. 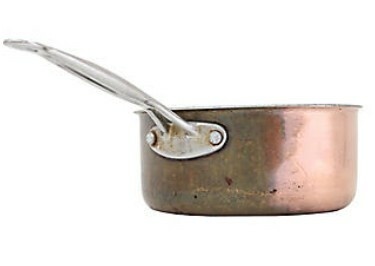 Anthea took a pot home and gave it a whirl on her 20+ years old copper frying pan; two decades of cooking had built up quite a patina on the base, but Bio-Mex took it in its stride. She was so impressed after cleaning the first half, she brought the pan to the office so we could all see the super shiny results. We’ve always been obsessed with cleaning, and from all the feedback we get via online reviews and chats in store, it seems like a lot of you are, too. Made with 100% natural ingredients, the non-abrasive, organic concentrates in this general-purpose cleaner dissolve dirt, grease and grime from almost anything; we know it takes care of metals, glass, ceramics, tiles, sinks, baths, pans, cooking surfaces and jewellery, but our customers have discovered a whole lot of other uses too… You’ve told us that, in the kitchen, Bio-Mex has removed years of baked-on grease and grime from old baking trays, restored white ceramic sinks that had been really stained, and removed all traces of that greasy film from the tops of kitchen cupboards. But it’s not just for the kitchen – we’ve heard of it cleaning cat paw prints from windowsills, soapy stuff from glass shower doors, grubby marks from trainers… and even the whole outside of a caravan! Powerful cleaners usually contain ingredients that are less than pleasant, but Bio-Mex uses only natural, biodegradable ingredients to achieve its sparkling shine. It’s non-abrasive and organic, yet leaves no grime behind, just a lovely lemon fragrance. And don’t be put off by the price – this universal detergent will last you a long, long time – so you really do get your money’s worth, especially when you consider all the things you can use it on. Its composition is a bit like a clay ‘stone’ (5-15% soap, ventilated white clay, vegetable fats, glycerine and lemon scent); to use it, you dampen the special scrubby-yet-gentle sponge and wipe it across the ‘cleaning stone’ before getting to work on your chosen surface. After that, just give it a wipe with a damp cloth, then gently buff to a shine with a dry one… we hope you’ll be every bit as impressed as us!